The cream floats to the top each spring when the finest track and field athletes compete in the Central Coast Section finals. And super sophomores Kiersten Dolbec, Kristin Rimbach of Prospect and Christine Ristow of Westmont will join seniors Brad Jacobs of Saratoga and Sameer Thadani of Lynbrook as part of that rich field on May 25 when the CCS championship meet is held at Gilroy High School. Jacobs, Thadani, Dolbec, Rimbach and Ristow each qualified as individuals for the CCS finals with top performances at the CCS semifinals held May 19 at San Jose City College. Saratoga also qualified for a super showing in the girls 4x400 relay. The Falcons foursome finished second to only top-ranked Mt. Pleasant in the 1,600-meter event. The Cardinals won the 4x400 in 3:58.02 with the Falcons close behind in 3:59.30. Jacobs finished just under the wire to earn his place in the CCS finals. The Saratoga senior ran 9:38.67 to finish 12th in the 3,200-meter run in 9:38.67. The top two finishers in each heat and the runners with the next eight best times qualified. Dolbec topped the high jump bar at 5-2 to finish third and claim her place in the section championships. Thadani sprinted to a third in the 200 in 22.19 to win place in the finals. He was also ninth in the 100 in 11.23, just missing a qualifying spot in that event. Ristow raced to a fourth-place finish in the 300-meter hurdles in 46.04 to advance to the finals. The speedy sophomore finished behind two seniors and a junior at the semi's. The winning time was 44.62, posted by Carmel senior Thea Lee. Rimbach topped the high jump bar at 5-2 to wind up seventh in the event at the semifinals. The winning mark was 5-4, nailed by Monta Vista junior Helena Montin. Aptos junior Janelle Coulter also topped 5-4, but Montin was the winner on fewer attempts. Five girls, including Dolbec, finished at 5-2 with only misses separating third through seventh place. The local qualifiers will be in the CCS field this Friday at Gilroy when field events begin at 4 p.m. and running events get under way at 6 p.m. The top eight finishers in each event at the semifinals qualified for the CCS finals. Saratoga junior Nicole Sabes and Westmont junior Marko Vatavuk just missed a trip to the championships. Sabes was ninth in the 800 in 2:19.28 and Vatavuk finished ninth in the 110-meter high hurdles in 15.59. 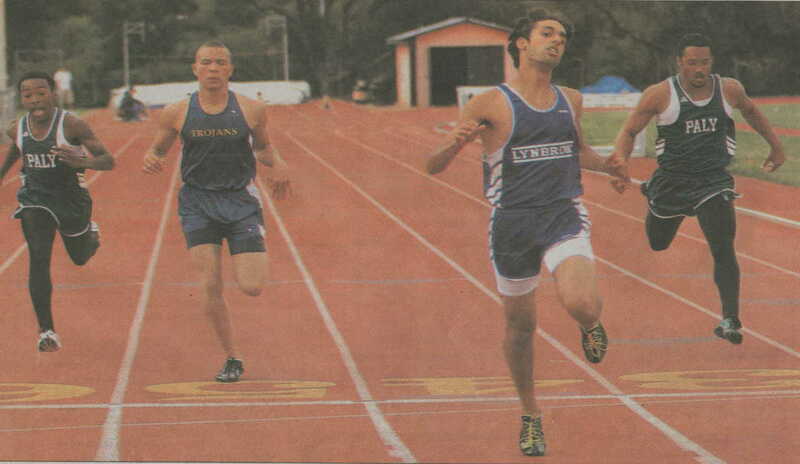 He also ran 21st in the 300 intermediate hurdles in 42.08. Senior Kevin Blakely just missed a CCS trip in the high jump, ending in a tie for ninth place at 6-0. Westmont sophomore Greg Talley was 16th at 5-10. Blakely was 12th in the triple jump at 42-2.5 and tie for 16th in the long jump at 20-6.5 at the semi's. Senior Sean Hutchison was 27th in the shot put at 40-9.75. The Westmont girls 4x400 relay ran 22nd in 4:16.70. The Prospect girls 4x400 relay just missed a spot in the CCS finals, running ninth in 4:01.84. Freshman Mariah Rogers finished 17th in the 100 in 12.90 and 19th in the 200 in 26.12, and junior Hannah Gilbert was 17th in the 400 in 59.75. Sophomore Jennifer Jasper was 13th in the shot put with a heave of 33-6.5 and 14th in the discus with a toss of 100-6. Sophomore Kevin Kapchuk was the top finisher for Del Mar at the semifinals, running 14th in the 110 hurdles in 16.00. Senior Ashley Hines was 20th in the shot put at 31.5 and 21st in the discus at 91-5. Lynbrook junior Eric Surprenant competed in two events at the semifinals but failed to advance. He was 13th in the 110 hurdles in 15.89 and 16th in the 300 hurdles in 41.29.